Wellington, FL - March 30, 2011 - In the closing week of the 2011 FTI Winter Equestrian Festival, the $8,000 G&C Farm 1.45m Jumpers were the first class in the International Arena. Laura Chapot of Neshanic Station, NJ, rode Umberto, owned by Mary Chapot, to victory. Week 12 of the FTI Winter Equestrian Festival is the final week and runs through Sunday, April 3. The week's feature events will include the $20,000 Junior/Amateur Jumper Zone Team Competition Final on Friday at 7 p.m., Round 1 of the $50,000 USHJA International Hunter Derby on Friday at 2 p.m., Round 2 of the $50,000 USHJA International Hunter Derby on Saturday at 7 p.m., and the Finals for the Adequan Young Jumpers on Sunday. The $50,000 USHJA International Hunter Derby will be webcast live on USEF Network and can be seen here: http://www.usefnetwork.com/WEFDerby2011/. 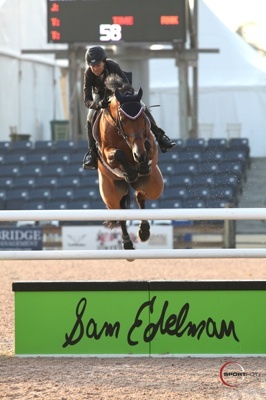 In the jumpers this morning, the course was designed by Anthony D'Ambrosio of Red Hook, NY. There were 15 entries in the class and seven of them were clear in the speed format. The fastest over the course was Laura Chapot on Umberto, who crossed the timers in 64.868 seconds. They were faster by four seconds over second place finishers, Nick Novak and YB Blue, who finished in 68.036 seconds. Third place went to Charlie Jayne on Sylvester, owned by Alex Jayne. They had a time of 68.727 seconds. Umberto has been placing well in the 1.40m classes this circuit, but this was his first time showing at 1.45m. Chapot said, "I'm really happy with him. He stepped up to the plate and proved he could do it. When you go in the 1.40m speed, they're always very competitive and you really have to take some chances and go pretty fast. He's just a fast horse in general. Even doing the same track and numbers with another horse, he tends to be just a little bit faster. It's just the way he moves. He's deceptively fast." On her round today, she commented, "I really didn't know how quick the class was going to be. I felt like I should just take a few chances and go for it a little bit, and hope everyone else had a hard time catching him. I just rode my plan and let his speed carry him." The Chapots found Umberto, a nine-year-old KWPN gelding by Celano x Roderik, through grand prix rider Cian O'Connor in Ireland. They imported him just two months ago. Chapot smiled, "We actually just saw him on a videotape and he sent him over. We didn't even go over there to try him. We took a little bit of a risk that it would work out, and it's so far, so good!" Chapot said that Umberto is fitting in well to her string of horses. "He's extremely careful and has a lot of speed, which I love. It's more my type of ride," she acknowledged. "Right now he's fitting in quite well. I think we're going to take our time and try and move him up gradually. I don't know what the end game is with him, but I think if we're smart about the way we manage him, who knows what he could turn out to do." The twelfth and final week of competition will continue tomorrow with the Charles Owen 1.35m Jumpers in the DeNemethy Ring at 9 a.m.